Ingredients: Water, chicken, wheat gluten, salmon, liver, tomato, carrot, wild rice, meat by-products, modified corn starch, soybean protein concentrate, salt, potassium chloride, zinc sulfate, ferrous sulfate, copper sulfate, manganese sulfate, potassium iodide, sodium selenite, tricalcium phosphate, choline chloride, vitamin E supplement, niacin, thiamine mononitrate, calcium pantothenate, pyridoxine hydrochloride, vitamin B12 supplement, riboflavin supplement, vitamin A supplement, folic acid, vitamin D3 supplement, biotin. This product is manufactured by Nestlé Purina Petcare. According to our data, this Beneful recipe provides complete & balanced nutrition for the maintenance of adult dogs. In other words, this formula is AAFCO approved. 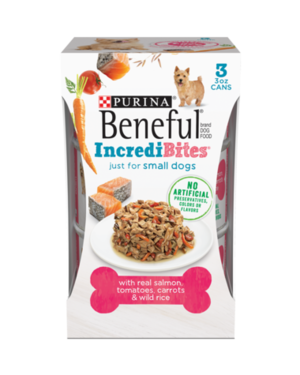 Beneful IncrediBites With Real Salmon, Tomatoes, Carrots & Wild Rice is formulated to meet the nutritional levels established by the AAFCO Dog Food Nutrient Profiles for the maintenance of adult dogs. We'll begin this review of Beneful IncrediBites With Real Salmon, Tomatoes, Carrots & Wild Rice with a detailed discussion of the ingredients. The first ingredient is water, which is a fairly self-explanatory ingredient. The second ingredient is chicken, which provides animal-based protein and important omega-6 fatty acids. The third ingredient is wheat gluten. Wheat gluten is the main protein of wheat. Although wheat gluten is mostly protein, wheat gluten is considered controversial because it significantly boosts the protein content of the product. This is undesirable because plant based protein does not provide the same amino acid profile as meat based protein. The fourth ingredient is salmon. Although salmon is an excellent protein and omega-3 fatty acid source, raw salmon contains more than 60% moisture. After cooking, the relative meat contribution of salmon is dramatically reduced. Therefore, it's important to ensure that other meat sources are included within the first few ingredients to ensure the product derives most of its protein from meat. The fifth ingredient is liver. Liver is a controversial ingredient because the source animal is not specified. Anonymous animal ingredients are typically very low quality and may contain almost any animal, including dogs and cats! Because ingredients are listed in order of pre-cooked weight, the remaining ingredients in Beneful IncrediBites With Real Salmon, Tomatoes, Carrots & Wild Rice are not as important as the first five ingredients. However, collectively they still have a significant impact on the overall quality of the product. Therefore, we'll continue discussing the remaining ingredients in this Beneful recipe. Next we have tomato. Tomatoes are naturally rich in various vitamins, minerals, and dietary fiber. You may have heard that tomatoes are toxic to dogs, but these claims are about the tomato plant, not the actual tomato. The next ingredient is carrot. Carrots are naturally rich in many vitamins and minerals. Then we have wild rice. Wild rice is a gluten-free grain which supplies protein, dietary fiber, certain minerals, and B vitamins. Moving on, we have meat by-products. By-products are defined by AAFCO as the "non-rendered, clean parts, other than meat, derived from slaughtered mammals." Thus, meat by-products contain nearly all parts of the animal which are typically not consumed by humans. These parts include the liver, lung, spleen, kidney, stomach, blood, intestine, bone, etc. Moving on with this review, we have modified corn starch. Modified corn starch is derived from the endosperm of the corn kernel. The modified term indicates that the corn starch has been treated or processed in order to expose or improve some property. Typically, corn starch is used as a binder in kibble. The next ingredient in this review is soybean protein concentrate. Soybean protein concentrate is produced by removing the water soluble carbohydrates from soybeans. The inclusion of non-meat protein typically degrades the overall quality of protein in the recipe. This degradation is due to the inferior amino acid profile of plant based proteins. Our next ingredient is salt. Salt is an important mineral for both humans and dogs. Depending on the quantity of salt used (which we cannot determine), salt may or may not be a nutritious addition in the recipe. potassium chloride is the next ingredient in this recipe, which is a potassium supplement. The remaining ingredients in this Beneful IncrediBites recipe are unlikely to affect the overall rating of the product. In summary, we recognize that this product contains anonymous meat ingredients. These are not necessarily always negative; however, they are typically low quality and inexpensive additions. If the particular anonymous meat ingredient is controversial or low quality, it should have been discussed earlier in this review. Otherwise, it is safe to assume the anonymous meat ingredient is an acceptable addition. The official PawDiet rating for Beneful IncrediBites With Real Salmon, Tomatoes, Carrots & Wild Rice is 2.5 out of 5.